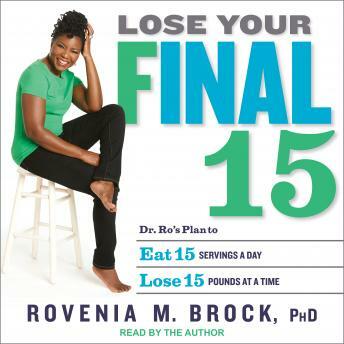 Written By: Rovenia M. Brock, Ph.D.
Narrated By: Rovenia M. Brock, Ph.D.
Dr. Rovenia Brock is the nutrition coach who helped Sherri Shepherd of The View lose more than forty pounds and viewers of The Dr. Oz Show shed more than 5 million pounds. In Lose Your Final 15, she reveals her best-ever program to help you lose fifteen pounds in fifteen days by eating fifteen servings a day. Dr. Ro's plan is divided into three fifteen-day phases. In each phase, you'll enjoy fifteen servings of food per day while learning to identify foods by their real serving size. You will then choose your fifteen daily servings from forty-five mouthwatering recipes like Black Bean Pasta with Shrimp in Red Curry Sauce and Melon and Prosciutto Breakfast Salad with Fried Egg, all developed by Dr. Ro to keep you satisfied and on track. Also included are easy, delicious fifteen-minute meals for those extra-busy days. Beyond just a diet, Lose Your Final 15 includes fifteen-minute meditation guides and exercise plans that fit into any schedule. With Dr. Ro as your guide, you'll experience newfound vibrancy, health, and happiness. by Rovenia M. Brock, Ph.D.